I’d been looking forward to the ferry ride. It was an overnight journey on a big ship that I’d hoped would be just like the various cruises I’d taken crossing the oceans of the world. But my hopes were not to be fulfilled. There was no swimming pool, no table-tennis tables, and most disappointing of all, no free food. Instead Dea and I sat in our little cabin and made ourselves sandwiches. We were too tired to do much more, but I ventured outside at one point and watched the lights of the northeast coast of England fading into the night as a cold wind whipped at my face. I knew it would be my last glimpse of the little island I’d once called home for a good long while. It was not the first time I’d left her behind to see the world, of course, but I still felt the same excited buzz, thinking of all the things I might see before I laid eyes on her again. The next morning I woke up early and rushed back outside to get my first glimpse of Europe. There was no sign of it, just ocean all around us. The Netherlands was not the kind of country to rise out of the sea, but a couple of hours later we did bump into it. Dea and I made our way down to the car decks to retrieve our bikes and there we encountered David, the cycle tourist we’d met a couple of days earlier. It was a shame that we’d not found each other on board earlier (perhaps because Dea and I were in our cabin eating sandwiches) for David was heading the other way from us and there would not be time now for a long chat. We had to make do with a brief conversation as we waited for the cars to depart before us, in which David revealed that he was indeed 69 years old, and planned to reach China in time for his 70th birthday. He said he’d found the last days in England tough with the cold winds and hills (but then so had I), although one thing was for sure – he was certainly more prepared than us. Not only did he already have many of his visas, he’d even got around to booking his accommodation in Dushanbe, Tajikistan for August the 22nd. That’s some good planning, David. There were a couple of other cyclists there too, a nice young British couple named Benny and Alice. They were on a little tour to Amsterdam and around, and as we all rolled off the ferry we decided to take a photo with all five of us cyclists together next to the sign welcoming us to the Netherlands. But there would be no cycling together for us. At the first roundabout David turned his bike north, with plans to go up to Groningen and Bremen before heading east across Europe. Benny and Alice went east for Amsterdam. And Dea and myself, well, we were going south. It was a beautiful sunny day that made us wonder just how long we’d been on the ferry, for the weather felt so very much improved. The cycling was easy of course, and the people were very friendly to us. Many times people asked us where we were going and wished us good luck, though sadly none were yet tempted to ask about the copies of my book I’d propped up in my basket in what I optimistically hoped to be a mobile bookshop. I’d thought that if we could sell a few copies of my book every day of the trip then we might yet come back rich. The problem with this idea was that my mobile bookshop had only four books in stock, and no room for more. “No, sorry Dea, they are called Custard Creams.” We both laughed. A lot. It was about the hundredth time she’d got the name wrong. It felt so good to be cycling through the dunes again. It was one of my favourite parts of one of the most cycle-friendly countries in the world, and everything felt good about being back there again. Not only because we were there, but that we were finally on our way to somewhere very different. The waiting was over, the journey had truly begun. On our first night we set up camp among the dunes with nobody around and laid out under the stars. “I can’t wait to do this in… Uzbekistan,” Dea said, plucking a country from the many she could have chosen. We both smiled at the thought of it – we were on our way now. Once again we cycled into Rotterdam. It was the third time within the last year we did so and thus the city had become a kind of hub for our recent travels without us ever stopping there to discover the place. This time however, we would make up for that and take in the place properly and spend more time with our friends, Martin and Susanne. They are the couple of fellow cyclists (you can check out their bike trip from Holland to Nepal on: www.twistingspokes.com) that also hosted us back in December (#4: Getting things in the right perspective). Since then, they had moved to a new flat in the centre of the city high up in a tower block with an amazing view over the city. There was a pigeon couple breeding an egg on the balcony and a bicycle sized elevator to take us and all our belongings right to their door step. After a relaxed evening with everything two touring cyclists could dream of (a shower, laundry, a delicious meal and catching up on travels and life) the next morning the four of us went out for a long walk around the city. Chris and I thought it a good occasion to introduce our hosts to our favourite game, The Spotting Things Game, and we made it in teams: guys against girls. Susanne and I were first to spot the Bonus Swap Item: A pink bicycle, but unfortunately we totally misused our advantage, when we swapped ‘Old red boat’ to ‘Stop sign’ and not ‘E-bike’. The guys soon spotted both bike and boat, whereas we realized that stop signs are a rarity in Rotterdam. We’d basically given them a two point lead and with Martin being an enthusiastic player who was not shy to walk close up to several people to see if they were eating soft ice cream the guys became the winners of the day to the girl’s sincere regret. Over the several hours walk Martin and Susanne picked out some really nice and really interesting sights. In the Markthal all kind of food product were for sale under the enormous arch decorated with big, colourful pictures of strawberries, flowers, bread and carrots. The cube houses Kijk Kubus were a cool and unique example of experimental architecture from the 1970´s and walking across the bridge over the river Maas we had great views of the different promenades of the harbour and their modern high rise buildings. At lunch time, we arrived at the lively Fenix Food Factory where food from all over the world was on offer. After a l ook around our choice fell on the Moroccan bread with various dips, and Martin and Susanne being the most generous people decided we should not be short on anything and put all the food and drinks on their bill. It was so delicious food and interesting to take part in the hipster scene of Rotterdam, similar to what we’d observed in many other cities, for a brief moment. “I don’t really know what hipster actually means” I said, as I realized that it was probably the most genuine hipster expression I could have said. Tired after the long walk we returned to the flat and in the light of the sunset over the city Chris and I made pizza to return the hospitality of our hosts and to celebrate two important events of the day. Not the guy’s victory over the girls, but that Chris officially had put his book for sale and now could call himself an author and that I had got a brand new, cute, little nephew back in Denmark. Crispy pizzas, strong Belgian beers, a good game of ‘Time is up’ and honest and profound conversations about being young people with an urge for travelling and a different way of living, all this made for yet another brick in our new, but quickly developing friendship with Martin and Susanne. When we cycled out of Rotterdam the next morning I could not have felt happier being so full of the good news from home, Chris’s bright book for sale in his basket, the memories of Rotterdam held in the sunlight being reflected by the river and the glass of the skyline high rise. It was like an explosion of life and love and on top of that, for each pedal stroke beyond Rotterdam I went into the new cycle territory of the world that was to be my future for the next few years. It was yet another sunny day and the temperatures had risen from day to day, so that we now could cycle in shorts for the first time. What an incredibly good feeling and what incredible white legs we both had. And when Chris also took off his sweater he spread out his arms and said: “Look at me! I’m wearing shorts and T-shirt. We have made it through the winter.” In a symbolic way it also felt like we had made it through to the beginning of something very, very good. “I could cycle here forever” Chris said as we enjoyed the smooth and well-structured network of cycle routes peacefully leading us out of the industrial city and via dikes and little villages. 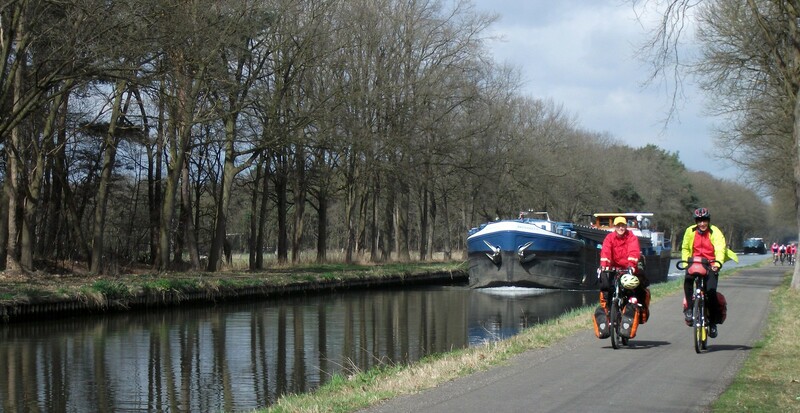 I think I will be longing back to the ease and peace of cycling in Holland many times during our travels. But there was no doubt, that we wanted more than ease and peace, and so we continued south towards the Belgium borders. And there was more than just the one Belgian border for us to cross. We’d actually chosen our route specifically after we’d spotted a bizarre anomaly on the map, that we wanted to investigate further. What we found when we arrived in Barle-Hertog was a very curious place indeed. It was a town in the Netherlands with a great many Belgian enclaves within it. Parts of the town were Dutch, parts were Belgian, and there seemed little logic behind the random organisation of it all. I got an early introduction to how strange it was when I stopped at a pharmacy to get some hayfever medicine. The woman told me that they didn’t have what I was looking for in the Netherlands, but that I might have better luck in Belgium. She then directed me to try asking a couple of streets away, as if it was the most normal thing in the world. We walked our bikes through the town to try and understand how it worked. As we went we several times crossed lines in the road with an NL on one side and a B on the other, indicating each border crossing as we moved in and out of the various enclaves. Outside of a supermarket a nice man came up to us to ask us about our trip, and we took the chance to ask him about his funny little town. He explained to us the historical reasoning, something about a deal between a Dutch duke and a Belgian prince or something. A couple of hours later we celebrated our full entry into Belgium with a round of penalty shootout next to the bicycle path where big groups of older people cycled past in colourful clothes and with curious, cheerful smiles. After a strong victory to Chris due to my non-existent skills in goalkeeping we joined the crowds and cycled towards Turnhout. As we were about to cross the railway bridge outside the town a couple approached us with curiosity and enthusiasm shining in their eyes. Chris and I already didn’t feel very ambitious about the day’s distance, and quickly agreed to accept the unexpected invitation. Together we all walked into town and sat at the town square in front of the big church, chatting and getting to know more about each other, and in the meantime Ludo took pictures and made little videos. They were a warm and humorous couple late in their sixties having Ludo’s 70th birthday coming up a few days later, and full of stories from a long life. They were now retired, and seemed to make the very most of their free time doing lots of sports, planning a month of cycling in Europe, volunteering with cycle training for kids and rickshaw rides for elderly people, Ludo was an active photographer and they also had their family close by. And then you would think they had enough happening around them, but no, they also had time and space in their hearts for Chris and me. They listened, asked and seemed so appreciative that we had accepted their invitation and wanted to share a day of our travels with them. The gratitude went both ways. We went back to their home and when Ludo showed us our bedroom, he added: “But if you (Dea) want to sleep with someone else, you can come in here”. That made me feel a little uncomfortable until I realised that in the other bedroom the gigantic cuddly toys were sitting on the beds, and I understood we had more in common with these people than I knew before. They let us have time for ourselves showering and relaxing before dinner and a nice evening together. “Do you mind, if I give you a hug?” was how we were greeted when we got up the next morning and no, we did not mind at all. After breakfast we packed the bikes, now with a new member of the cuddly cre w, Connor the Clown who had come from Ludo and Alda’s toy shop they had owned and run for many years before they retired, and now was given to us a guardian angel/clown. We said goodbye to Alda, hoping we would be able to return for a visit on the home stretch a few years out in the future. Ludo would cycle with us for 25 kilometres along the canal that ran to the east, and on the peaceful ride where big old trees reflected in the still water that stretched in a straight line in front of us, we had the chance for more talking. Ludo was riding a wonderful bike with a Belgian colour scheme of black, red and yellow and with his own cuddly toy hanging in a strap around its neck from the pannier. In May he would ride this bike to Vienna together with Alda on her e-bike. They didn’t have set plans, but a month of free time to go along as they wanted. We reached the point for the goodbye, it had been some special 24 hours for all of us and an experience I could never have anticipated. Ludo filmed us as we cycled past him and away along the canal and Chris and I took each other’s hands because we were happy and because it would make a great movie. The rest of the way through Belgium we followed this canal that we had not known about the day before. It was an easy, peaceful ride as we had the wind behind us and we were met with greetings by the passing road cyclists and had a short encounter with Yvette, who was feeding ducks and greeted us “Toi, toi, toi” which meant something like “good luck”. My experience with Belgium had been different from what I had imagined in a very positive way. For us it was really a great great pleasure to spend that short time togheter with you. You are such two lovely persons…. Also many thanks for the lunch-box picture and the picture from Alda and myself. Most of the time i am at the other site of the camera … I will print them out and maybe i will put them on the wall in the toilet 🤓, the best place in house where everyone can look to them without timepressure’😏. We are the ones saying thank you, not just for your hospitality but also for that special place in you hearts where you keep us. It is a good place to be! We hope to come back to Tunhout one day and find our pictures of you in the bathroom. We do our best to enjoy the ride and we wish you a lot of fun and joy (and not too much more rain) on your ride through Europe this month.